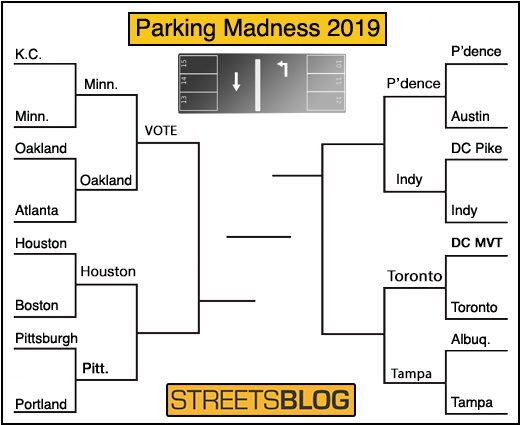 Elite Eight action continues here today at Parking Madness, Streetsblog’s search for the Most Improved Parking Crater in America(™). Things are really starting to get interesting. The results so far: Minneapolis knocked off Kansas City — 64 to 36. Oakland came out on top of Atlanta, with 68 percent of the vote. Providence jetted past Austin to face Indianapolis, which overcame D.C. Toronto and Tampa vaulted past Albuquerque and D.C.’s Mount Vernon Triangle. Voting is still open for yesterday’s Elite Eight matchup: Minneapolis vs. Oakland. This entry, showing changes in downtown Houston over the last 30 years, comes to us from the transit planner Christof Spieler. This site overcame Boston’s Seaport, a world renowned former parking crater, to reach this round of competition. 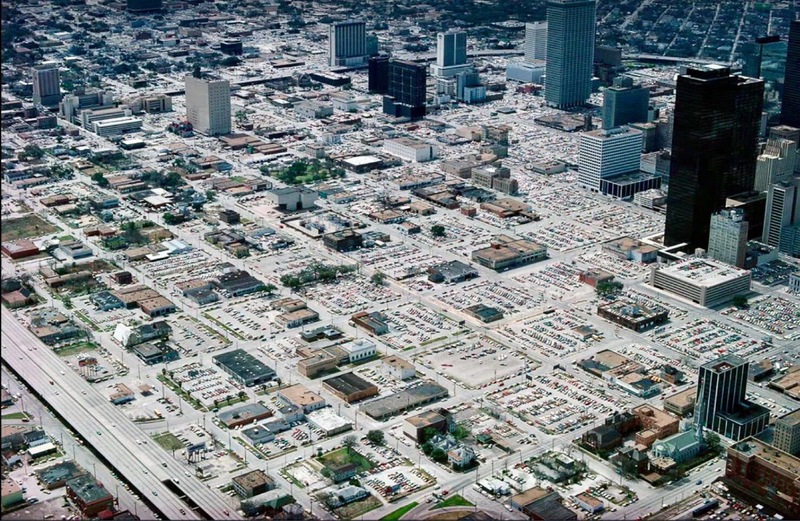 That’s a big win for the Big H.
One of the most famous photos of Houston is the Alex Maclean aerial photo of parking lots in Downtown Houston in the early 1980s. 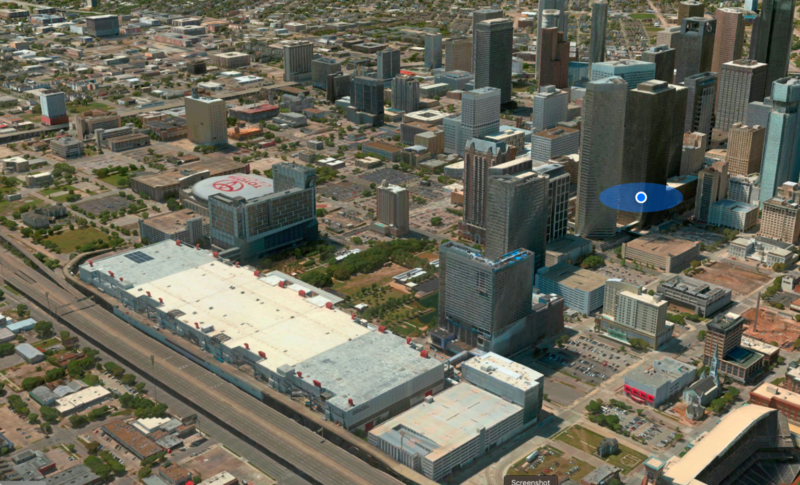 That exact spot is now Discovery Green, a thriving urban park, and the surrounding convention and hotel district. He adds that the “after” photo isn’t up to date. One of the lots has since been converted to a performing arts high school. What a neat example of the opportunity cost of dead parking lots in urban areas! This is a beloved place in Pittsburgh: Schenley Plaza. But not that long ago it was just a well landscaped parking lot. 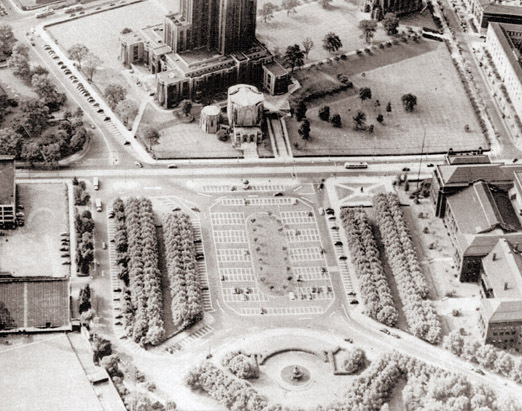 The five-acre plaza is located on what was a large, 280-space parking lot in Oakland and situated between the University of Pittsburgh, Carnegie Mellon University, Phipps Conservatory, and the Carnegie Museums and Library. The Pittsburgh Parks Conservancy, in partnership with the City of Pittsburgh, transformed the space, and today this much-loved community greenspace attracts hundreds of thousands of visitors every year, providing gathering places, entertainment, and a grand entrance to Schenley Park. In addition to plenty of green space, the park includes, a carousel, a full service restaurant, dining kiosks and restrooms. So in Houston they occupied 5 blocks in a row with a single building 1/3 mile long, impassable even for pedestrians. Was it absolutely necessary? Glad to see Houston moving in the right direction but still kinda meh. 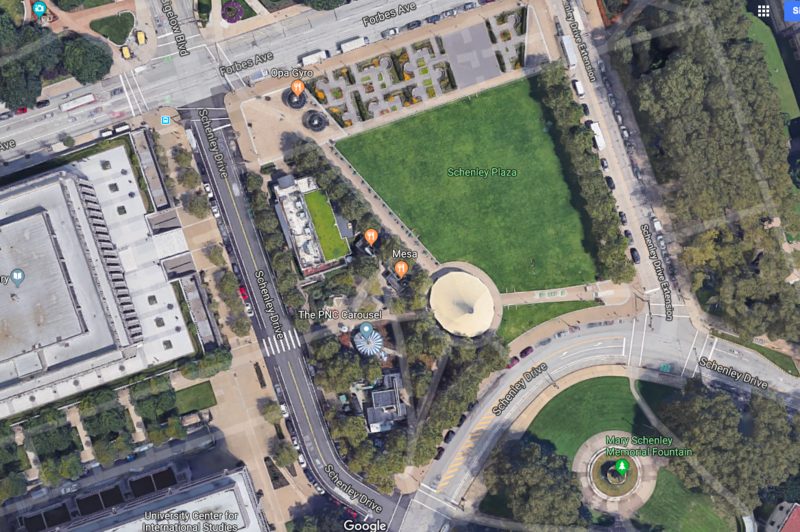 Pittsburgh is a nice neat example of reusing an necessary parking crater for a great public purpose.